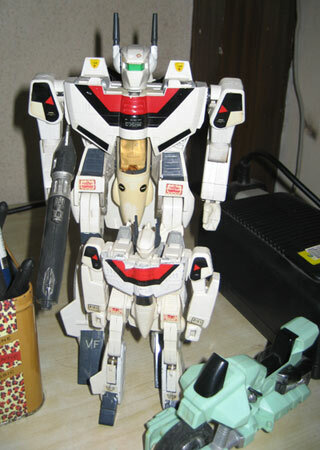 I confess, that I keep my 23 year old 1/55 VF-1S Strike Valkyrie from Bandai on my home work table to inspire me. Along with that is his baby brother, a bootleg VF-1S that I inherited from my brother (he tossed it away) that he got for Christmas from a relative. With them also is a Mospeada motorcycle made by Matchbox from the Robotech series. I have a GBP armor kit for the VF-1S that I make it wear occasionally. I should get shots of that in the future. Sadly, due to my clumsiness the cap on the edge of the gun pod tore off. In my desire for uniqueness, I also painted some of the gunpod silver... ack, big mistake! After 23 years, some of the plastic parts had turned yellow. I'm not sure as to why, considering that I kept them away from sunlight. Also some paint had chipped off and the stickers had turned dirty, making their outlines very visible. Still, I wouldn't trade them for the world. Oh, and there was the short struggle, of trying to not let my son get his hands on them. But he's a good kid and he now knows not to touch Daddy's toys. God willing, I might be able to enlarge this family of mine with new members in the future. That's why I keep stalking also HLJ for Macross toys on sale.